For more than 50 years the Lions Club has provided eye exams and new eyeglasses to low-income residents. All ages, children and adults, who qualify for help, are served by this program—more than 300 per year. If you need help please call 970-377-2282 and leave your name and number. Interviews are held the 3rd Thursday of each month by appointment at First United Methodist Church, located at the corner of Stover and Elizabeth Streets. This program, which started in early 2001, utilizes a special camera that detects vision problems in young children quickly and the process is totally non-invasive. The equipment is designed specifically for children and is “kid friendly”. This equipment allows us to detect six common vision problems in children that are risk factors for Amblyopia (lazy eye). If left untreated amblyopia can cause vision loss in children. Amblyopia occurs in about two percent of children. 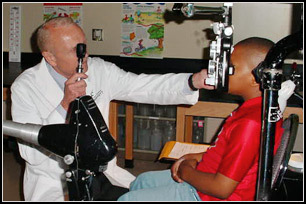 Identified children will be referred to a local eye care professional for treatment. 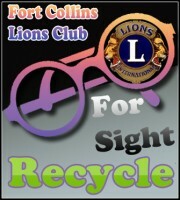 This center, located in space provided by the main Fort Collins Library, was established by the Fort Collins Lions Club in 1996, with a gift of more than $11,000 in equipment. The facility contains equipment for synthesized speech, a scanner, to assist the visually impaired with reading reference material and using a computer. Alternative print formats are offered, including large print, Braille, and recorded cassettes. Each year, more than 10,000 pairs of used eyeglasses are collected in Fort Collins. After they are cleaned, sorted and packaged, groups of volunteers (including Lions, Church groups, optometrists and/or ophthalmologists) go to developing countries, usually in South or Central America, or Africa and distribute the recycled eyeglasses to those needing vision correction. Used eyeglasses are also provided to migrant, non-citizen workers and their family members in the United States.